Raccoons are one of North America's most populous mammals and are found almost everywhere in the country. The animal ranges from northern Canada straight down into Central America and has adapted to live in rural and urban environments. The adaptability of this species is what has led to it being so widespread. The main physical advantage the raccoon has developed is an almost humanlike hand structure. A raccoon's paws are like tiny versions of a human hand, making them dexterous and capable of complex tasks. These agile, five-fingered paws help the animal search for food in hard to reach places and are also efficient for climbing almost anything that offers hand-holds. The raccoon's solid body and bone structure are also beneficial for protection against falls. Drops of up to 40 feet to the ground are shrugged off easily. The animals are also capable of fast running speeds despite short legs, sometimes reaching 15 miles per hour at a sprint. During the winter when food can be scarce, the raccoon does not hibernate but does sleep for extended periods when the weather is at its worst. The animals live on fat reserves and can lose up to half their body weight during these periods. 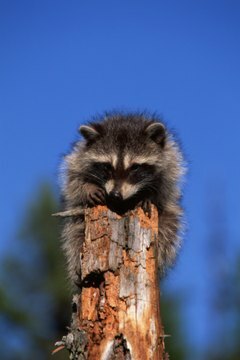 Raccoons are adaptable when it comes to finding a home and will live anywhere such as tree stump hollows, caves, woodchuck burrows, deserted buildings or attics of occupied buildings. A key reason for the animal's success in thriving is the adaptability of their diet. Using their dexterous paws, the raccoon is an adept fisherman, snatching small fish and crayfish from rivers and streams. It is an opportunistic eater and will eat whatever is plentiful in its home range. In some areas fruit and plant material makes up the bulk of the animal's diet. In others, small mammals, amphibians and insects are more common food. In urban areas, where wild food is less common, the animals turn to humans for food, often raiding trash cans. The size of the animal and its dexterous fingers mean it can knock over the cans and even pull off the lids in search of food. Raccoons can hold their own against some predators, fighting off animals almost twice their size with fierce tenacity. The main defense the animal has in avoiding most predators is its nocturnal lifestyle. The ability to climb quickly also helps to escape ground-dwelling carnivores. Even with avoidance and fighting back, the animals do fall prey to a range of predators such as coyotes, wolves, snakes and large hawks.